Home » Friends » Luneta » Singer Philippines » I'm so tired, I give up! I'm so tired, I give up! My officemates from my previous work have arranged an impromptu get together prior to the planned Singer Employees mini reunion that would be happening come the 20th of this month. During the holidays some of them have taken their vacation back home and part of their itinerary would be seeing friends from their former friends from work, that's Singer. To a Singer employee, that is a Singer legacy not just the first ever sewing machine invented as what everyone has perceived. Singer was not just a place of work but a second home. Most of its previous employees would resign because they were petitioned by their family or they have to work abroad while others due to its retirements, most of them have rendered more than 20 years of happily serving the company, by the way. It was only in Singer that you can find a previous employee who despite traveled the globe when they have a chance to visit home they cannot forget to bring pasalubong, chocolates would always be the generic items that would be distributed equally to all the employees even it would mean a combination of any two bite sizes of Kisses, Snickers, Mars or Babyruth. Until some four years ago, a new management was installed. Manned by a Srilankan who resembles to a growling ape (I'm sorry, Srilankan I just happen to hate this man, I like you matter-of-factly, except him, lol). He was the kind of boss who everyone won't want seeing him (imagine the movie – The Devils wears Prada). He was the worst person this earth have ever walked. And while it is true that I despise Singer, that's because of the mismanagement by the power monger and money hungry individuals. The truth of the matter, Singer would always be a family to me. With Singer, I have made friends not just friends but bestfriends. I am one of those infamous employees, Singer has employed yet they never deprived me of the friendship. Despite of my hard-to-please attitude, lols, surprisingly I am friends to most of them. I have made quite of godsons and god-daughters mostly because their parents were a friend from Singer. Singer may have gone but to its previous employee, the friendship still lives on, thanks to Facebook, we can say "Hi and Hello" regardless of what continent we are in. Now, as you can see – this is not what my title suggests. So, let's start the real topic, lol. Because we want a venue that would be accessible to anyone, we have trimmed down the options and unanimously agreed to hold the reunion at the Rizal Park, Luneta as they popularly call it. It was my first time to actually explore Luneta in its nakedness. Previously, Luneta's credibility was always links to be a "Jologs" place that home to pickpockets, snatchers and robbers. Now, Luneta is a picture of class with lots of fun in it. It's clean, the area is well maintained and with security guards visibility, a sight that would make you safe in a way. Aside from the classic statue of Dr. Jose Rizal, another eye-catching figure would be the enormous stone figure of Lapu-lapu facing our national hero, it's really a big one. The statue looks like, Machete; imagine the horror if you happen to be in the area at midnight and all of a sudden the figurine comes to life, ayayay, lol. And who would ever want to miss the famous dancing fountain that changes its rhythm according to the melody of the song being played. This one is a big hit, the moment it start dancing people around would start running to the closed fence that surrounds the area just to make a closer looks to the giggling waters. I myself can't help moving my body as Lady Gaga's Bad Romance was playing while shots of water accompanied by red lights would splash up to the air in rhythmic with the song. No again, this doesn't suggest about the title, eh? Prior to going to Luneta we had made SM Manila to be the rendezvous. And one of my friends, whom I have made his son my godson, came. The last time, I seen him was on his first birthday. I gave him a small motorbike, I didn't knew he grows up to be a foreigner, lol. Yes, a foreigner that's because he do not speak local, I mean he's English speaking. Uh, you really are so "totyal", I told her mother. Why, didn't you give me a hint, I wasn't prepared. In short I had a nose-bleeding experience - haha. Now after seeing me he immediately asked me to buy him a toy and drag me to a toy store, "whoah wait". I only have enough money to keep me from going home because I thought we're just going to see the place. And my godson, started to hand me the toys of his choice, "Oh my God", it cost, Php 1,279, Pphp 499 and Php299. I was relieved by the last one but he was crying because he wants all. Good riddance, his Mommie come to the rescue and tell him where off to go. We left the toy store without the toys and he's crying "I give up", "I give up". 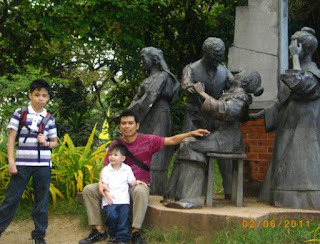 When we reached Luneta we were in good terms and he started to drag me around the place. I have suddenly enrolled to "How to Babysit in 3 Hours". I become the instant babysitter. 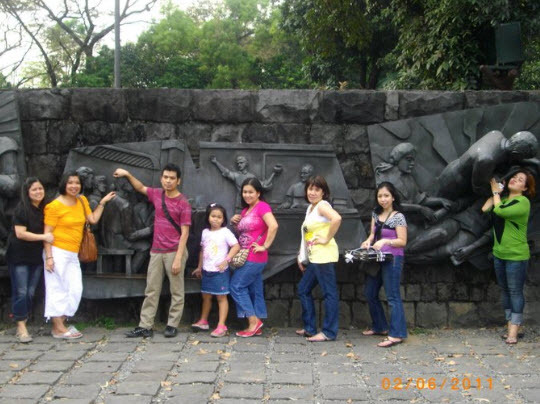 We have roamed every part of Luneta where the Heroism of Rizal was re-enacted. Fifteen minutes before six a loud voice was heard, thanking everyone for the patronage and that section of the Park will closed at exactly six. I was relieved and shouted. "I'm so tired! I give up! Resulted them to laugh hilariously.